Feed Wrangler is also available as an iOS app. With two months left to go, the post-Google Reader landscape of RSS services is still sorting itself out. The newest player? Feed Wrangler, a paid subscription service from the iOS developer of Check The Weather and Audiobooks. Feed Wrangler launched Tuesday on the web and as an iOS app, sporting a membership fee of $19 a year. (Users can purchase access through the site or the app.) Developer David Smith said the paid model may be the best way for small services like his—and in the wake of Google’s demise, well, all of the services will be relatively small—to survive and thrive into the future. Aside from the paid service, Feed Wrangler should be familiar to anyone who has used an RSS reader—in fact, it’s bit more stripped-down, visually than even Google Reader. 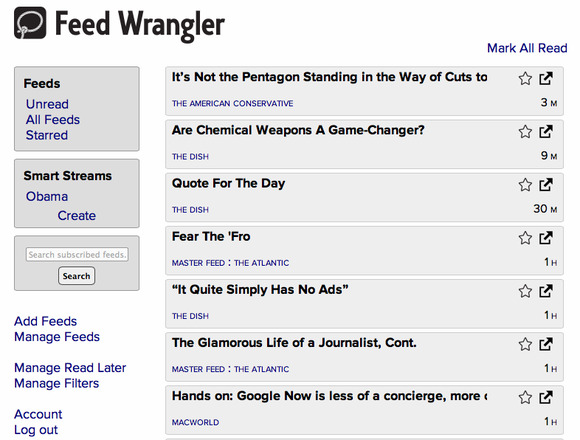 It’s possible to import one’s collection of feeds from Google Reader into Feed Wrangler, although (in my testing of the service this week) it seems to have trouble distinguishing between various blogs from The Atlantic, and will just lump several of that magazine’s author feeds into one Master Feed of everything that organization publishes. After you’ve chosen your blogs, you’ll see a feed list of blog headlines; just click on the headline to get the full post. If you like a piece, you can “star” it, or save it to read later in Pocket or Instapaper. 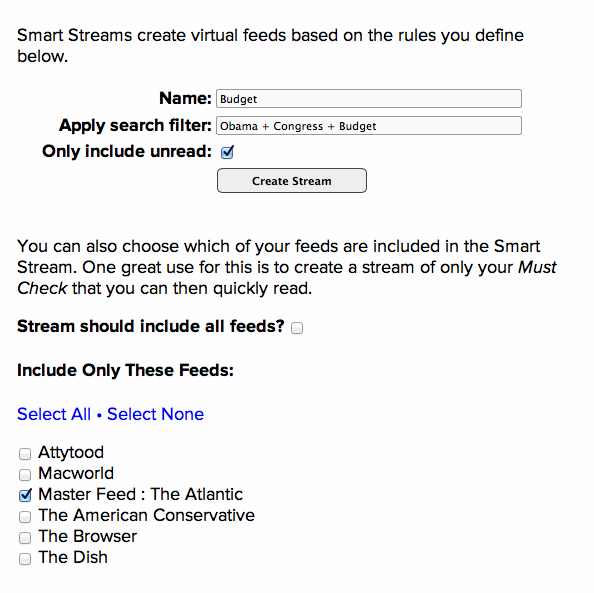 Users can also create feeds for, or filter out, certain topics in certain feeds. There are no folders here. 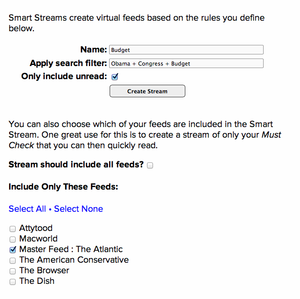 Instead, users can create “smart streams” by entering criteria for various topics that they want to read about; similarly, you can create filters to mark certain topics as “read” without having to skim through them. You’ll never have to read about Congress again! The iOS offering is similar, but perhaps slightly more aggressive in its aesthetic, with a bright blue banner across the top of the page, headlines in a bold font, and (unlike the Web version) a few words from the summary of each post. 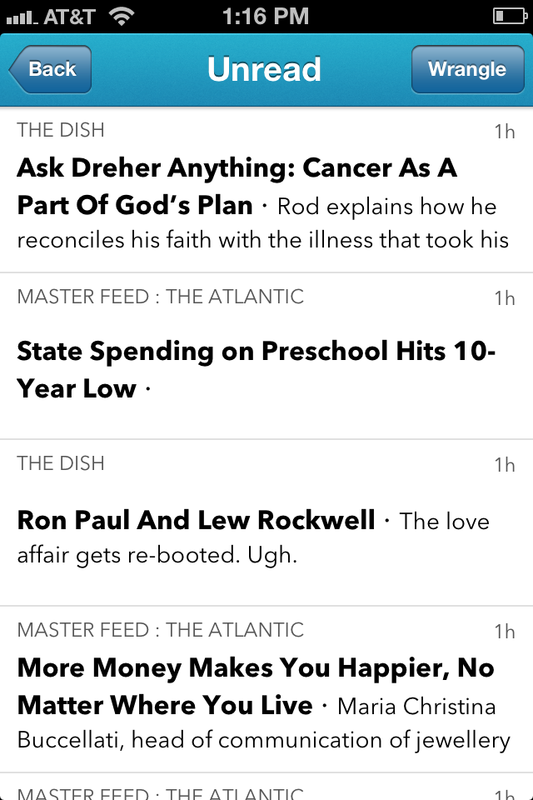 You can also use the "wrangle" button in the app to organize your feeds and mark everything read. 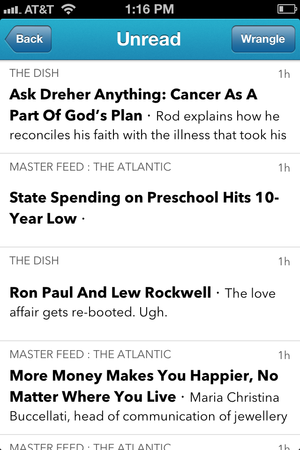 If there are no new posts in your “unread” feed, the app will suggest you read something from whichever read-it-later service you’ve tied into the app. Smith said in an email to Macworld that he hopes to soon have a Mac client to join the iOS app, but those might not be the only ways to get Feed Wrangler in the future: He’ll open the API to third-party developers and allow them build off his platform. Because the money is in the subscription and not the app, Smith said, he can open up the ecosystem to anyone who wants to participate. Google Reader, meanwhile, officially closes on July 1.